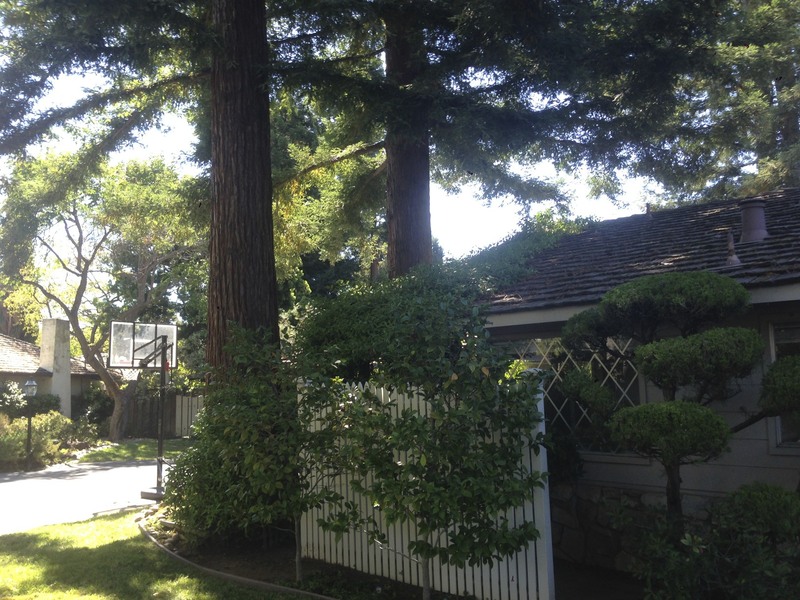 There are a couple of nice, healthy-looking redwoods growing near the left front of my house (we bought it recently), probably about 8-10 feet from the front-left corner of the house. A recent home inspection report said that the foundation looked okay, but that there are roots in the crawl-space. How concerned should I be? What is the the best-case and worst-case scenario here? What did they say about your roof? The trees are great shade. But that shade can come at a cost. I don't even know if it is legal to remove giant redwood? They are beautiful trees. I would be more worried about that vine growing on the roof That can cause problems with the shingles. I supposed that you had the inspection done after you signed the offer paper. 1 Check with local codes you may not be able to remove even if you wanted. 2 have an arborist inspect the trees to see if they are sound. 3 Maybe have a tree service remove some of the lower branches. Use the service recommended by the arborist. By the way it will probably cost you about $5-8K per tree to cut down they will need a crane and a cherry picker to take them down due to the closeness of the houses in the area. Wow! Awesome trees. Sometimes I wonder about the thinking process when planting trees or building a house around them. It's like they don't think of the future. The best thing to do is always keep chopping the top of a tree so it doesn't get tall and instead will bush out. I do it for my Pine. It would of been 50 feet by now but I got a nice pruned 20 foot Christmas Tree instead. With yours it's already mature and too old to "chop the top". I'd be more worried about the roots and the drainage pipes & water lines underground. I hate to say "take down a tree" but if you do, just plant a new one somewhere. Thanks guys for your help/advice. The roofer said the roof is in good shape. He said it looked really old when he saw it from the outside, but once he got on the roof it looked really good. He said we had 8-10 years left. He asked us to get rid of the vines right away, which we are doing before we fumigate the house. We have an arborist coming to see the house. The local code seems to be that if a certified arborist says that the tree is damaging the foundation, we could apply with the city to get a permit. We'd also have to get the neighbors to agree since the trees are on the property line. Yes, we loved the trees too. The fact that a tree could be an "issue" for the house never even occurred to me until I saw the home inspection report that said we had roots in the crawlspace. I think the previous owner underestimated how big the redwood could get (duh). 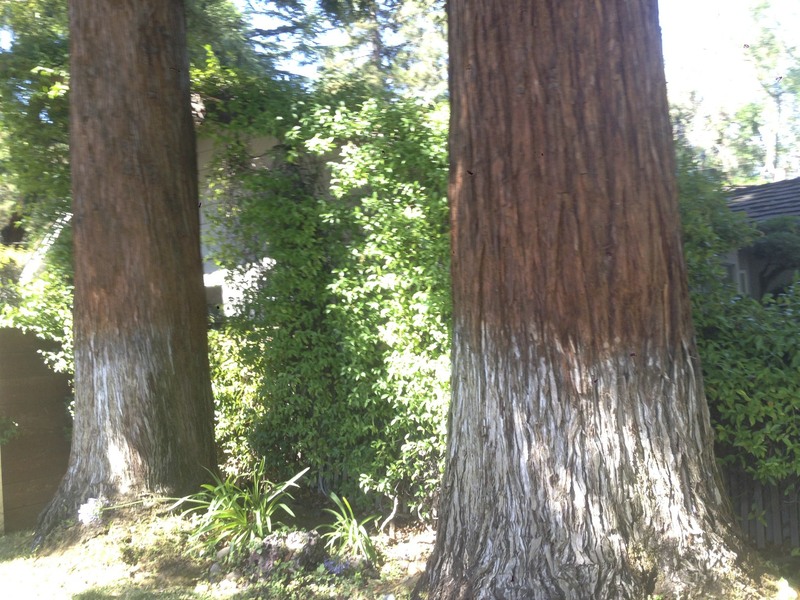 I was also puzzled about why he planted two redwoods, that close to one another. BTW, how can I verify the drainage and water pipes, short of hiring someone to dig them up and check on them? how can I verify the drainage and water pipes, short of hiring someone to dig them up and check on them? Good question. I wonder if thats a topic to start in the House forum maybe a plumber will reply or someone who had the issue. You'll probably notice a pool of water forming on the surface quicker if there is a hole in the pipes underneath. It would mean your waste or water is leaking out of the pipes. 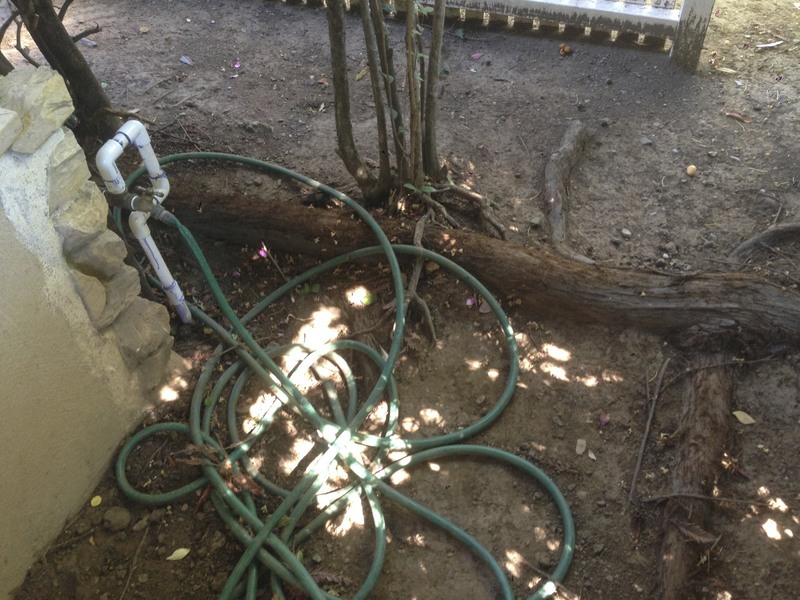 Pipes naturally corrode over time (decades) and if you have strong enough roots they can easily make holes in them. Figure out where the water/sewer lines are running to and from the house. Well, I'm jealous! I love those trees. haven't so far, I would defintely keep them. about, it is the house, besides the roof. roots out of your sewer drains, ask about it. Congrats on your new home, and those beautiful big redwood trees. You might want to try contacting one of the few sawmills that process redwood? That is if the ultimate decision is to remove the trees. Possibly selling the wood would help offset the cost of tree removal? My feeling is that it will cost a small fortune to have those tress professionally removed. If you Google redwood saw mills you will find only a few to contact. The best thing to do is always keep chopping the top of a tree so it doesn't get tall and instead will bush out. Sorry, Cam but this is one tree that you never want to top according to the certified arborist that I had come check out when I lived in CA. Here's a link to a good article about them. As for what people are thinking when they plant too close to the house - well one year conditions were just right and in my front garden area I had about 30 little redwoods sprout up. I let them grow to about 6" tall, dug them all up and gave them to horticulture center at the local college and they were very happy to have them. If I hadn't been paying attention many of them might have gone on to become bigguns and I think that is what sometimes happens, folks let volunteers just keep on growing. The first couple of years living here in VA I had at least a dozen volunteer silver maples sprout up each spring until I finally had to cut down the two 80" ones in the front yard that were in very bad shape and might have come down in a big storm and crashed through my roof. I really had to be vigilant about looking for those volunteers since they grew so quickly and the tap root went down far and fast in just one summer and it was a tough job to get them out. After that first summer I learned to search and destroy early. Last edited by zugor; 07-13-2014 at 05:09 AM..